Facsimile of ca. 1912 label that was applied to the backs of first quality axes made by the Louisville Axe & Tool Co.
Facsimile of the cover of a ca. 1912 brochure distributed by the Louisville Axe & Tool Co.
Information gathered from trademark registration papers and pocket catalogs indicate that the Louisville Axe & Tool Company was founded around 1908. That determination is based on the fact that February 15 of that year was the date noted when the company started to use the brand name HIGHLAND CHIEF. The registration application for that trademark was filed on May 19, 1908. At the same time another application for a different axe trade name was filed. The second name was W. J. SAGER. The HIGHLAND CHIEF trademark was issued as No. 71, 068 on October 27, 1908 while the W. J. SAGER trademark wasn't issued until December 1, 1908. That one was registered as No. 71,584. An interesting aspect of the two filings was that they were signed by the General Manager, W. J. Sager. It is believed that this was the same William J. Sager who had been one of the principals of the Warren Axe & Tool Co. The operation of the Warren Axe & Tool Co. was turned over to Herbert P. Stone in 1900. Stone apparently ended up taking over the company completely and it is believed W. J. Sager relocated to the Louisville, Kentucky area on a part time basis. 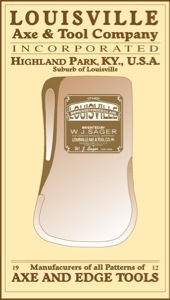 Another point indicating that W. J. Sager was the same Sager as the one associated with the Warren Axe & Tool Co. was the fact that some of the labels used by the Louisville Axe & Tool Co. included "Tempered and Finished By A Chemical Process Patented Aug. 18, 1896." That process had been patented by William K. Thompson of Alexandria, Indiana. On a letterhead dated February 1, 1913, the printed copy indicated that the company was a manufacturer of all patterns of axes and edge tools. The text of the letter advised that the company would allow the same terms as other manufacturers offered to jobbers. The inset picture of the plant showed a rather large facility encompassing a number of structures. The company name was included under Fire Axes in the Tenth Addition of Thomas' Register dated October, 1918. How long the company continued to manufacture axes after that, has yet to be determined. It is known that the company continued in business until 1962 but at sometime in their operational history they apparently redirected their efforts and advertised themselves as manufacturers of Electric Railway Specialties. They used that terminology on their letterhead dated December, 1932. Facsimiles of labels as depicted in company brochures. Note that the black label and the red label are basically identical except for the color and lettering style of the the name ORIGINAL..
Label adapted from one registered to the Highland Tool Co. in 1906. Registered to the Louisville Axe & Tool Co.